We don't offer window cleaning as an extra like some commercial cleaning companies, we don't sub-contract work we can't handle, we don't become unreachable if problems arise and we don't subsidise larger national companies by charging smaller local companies higher rates. We pride ourselves in treating everyone the same, providing an honest, friendly, reliable, professional window cleaning service. 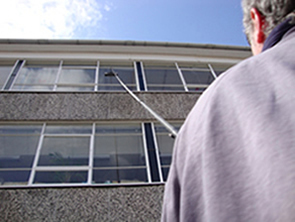 For over 60 years, Glen Window Cleaning has been providing unbeatable window cleaning at quality prices. Known throughout the North East for our service, we strive to impress, guaranteeing satiifaction from start to finish. Whatever your needs, contact us today for a free, no obligation on-site quote and we'll discuss the most cost effective way of carrying out your cleaning. All work is carried out by our CRB-checked staff either traditionally, conventionally or by using pure-water fed pole systems approved and opperated to the latest Health & Safety standards.